There are monkeys in my coconut tree. No, really. Little Capuchin monkeys–the “organ-grinder” kind. We live a few miles from the Miami Metro Zoo and assume they escaped after one of our hurricanes. If so, they hiked several miles before finding the county-protected wooded area behind our house. We’re just glad it’s monkeys and not rhinos. Everyone knows what to feed monkeys. I have no idea what to feed a rhino. There are three of them. We’ve watched as they climb through the trees in the protected wooded area, climb over our back yard fence, and make the quick scamper into one of our coconut trees. They like to sit on a palm branch and eat the little coconut eggs (or whatever you call them) and chirp with delight. They actually sound a lot like I do when eating a Heath Blizzard at Dairy Queen. They showed up quite often before (we assume) the county monkey squad caught them and returned them to the zoo. But for almost a year, we enjoyed sitting on our back porch, sipping coffee while enjoying the traveling zoo. In fact, I highly recommend that when you have the opportunity, you should sit on your back porch and watch monkeys eat berries in your coconut trees, too. His name was Reepicheep and he was named after the pugnacious talking mouse in the C.S. Lewis Chronicles of Narnia series. He came to live with us when I was ten years old. We got Reepicheep from the Amazon — not the online place that sells everything except monkeys — the actual place in South America with jungles, wild animals, and piranha. Just to make sure, however, I went to Amazon.com and typed in “monkey.” I was relieved to see they do not sell Capuchins. At least not yet. Reepicheep arrived via missionaries traveling on furlough to Miami. But as so often happens when foreigners get a taste of America, he didn’t want to go back. So when the missionaries went back to South America, Reepicheep stayed with us and become an illegal alien. Reepicheep lived outside in a treehouse my Dad built specially for him. It was a lovely but sparse two story condo with a front porch. To keep Reepicheep from wandering off and joining a gang, he wore a leather belt around his waist which was attached to a light chain about five feet long. The chain was attached to a pulley wheel which was attached to a strong cable with one end anchored to the tree and the other end to the corner of our house about 30 feet away. Got it? This set up is important because Reepicheep taught himself the most amazing Tarzan-like trick which he performed all day long. He would casually stroll to one end of the wire cable and dive off in a headfirst bungee jump. Knowing exactly how far he could free fall before the five-foot chain would jolt him by the waist, he would deftly grab his chain and swing like Tarzan to the other end. Honest! The only thing missing was Tarzan’s jungle yell. I used to charge the neighborhood kids fifty cents to come over and see our monkey swing. I made $18.50 the first weekend we had him! One of my jobs was to feed the monkey. This meant I would have to climb about seven feet up the tree, find his metal food dish, climb back down the tree, walk back inside the house, fill his tray with left-overs from dinner (no Purina Monkey Chow for our chimp), then climb back up the tree and hand over the dish. At first it was sort of fun, but after six or seven months of this, it lost all its excitement. So one day, in a moment of adolescent genius, my brothers and I decided to hang a rope swing. We figured we would not only save gobs of climbing time, but our “speed feeding” system would actually make feeding the monkey fun again. We attached one end to a thick branch and the other end to a deflated inner-tube tire. The trick was to run as fast as you could and dive into the inner-tube. If done right, your momentum would carry you all the way up to Reepicheep’s tree-house. Once there, you had to then reach out and grab onto the tree house and hold yourself in the precarious prone position long enough to locate the metal dish. It was a thrill seekers delight. It became even more dangerous, however, when Reepicheep turned mean. I don’t recall exactly when he turned mean, but I think it was right around the time I started throwing mangos at him. Reepicheep was amazingly agile and hard to hit. At first I thought he enjoyed our little game of dodge-mango, but as it turns out, it just made him cranky. Even so, feeding the monkey had now become fun once again. If Reepicheep was in a good mood, you could swing up and chat and play with him for a while during your search for his food dish. If, on the other hand, Reepicheep was feeling a bit irritable based upon the amount of mango juice dripping from his fur, it became a rather daunting and terror filled experience. It’s amazing how scary a two-and-a-half pound ball of fur with fangs can appear at dusk. So it was, on a particular summer night in Miami, I was trying to coax the little ape away from his treehouse to the other side of his cable by our house. A couple of near miss mango tosses were doing the trick and Reepicheep was as far from his tree house as he could possibly get. My plan was to take off for the tire swing, dive into the inner-tube, swoop up to the treehouse, grab the food dish, and swing away to safety before the savage beast reached his house. It looked good on paper. I lobbed one last mango to distract Reepicheep. My ploy worked as the gullible long-tailed organ grinder wasn’t even looking when I took off for the inner-tube. My dive was close to perfect as I launched myself into the tube and felt the momentum propel me upwards. I smiled at how smoothly my plan was working and how easy it was to trick a primate whose brain was much smaller than the mangos he was dodging. At the same time, I could hear loud snorting coming from the enraged orangutan running as quickly over the cable as his hairy arms and legs would take him. I grabbed onto the treehouse and began a mad scramble for the metal food dish. That’s when I swore I heard the little ape let out an evil laugh. He had purposefully moved his food dish to a little crook in the tree and was closing in fast. He was almost close enough for me to see some mango dripping of the left side of his face. Panicking, I tried to reposition myself in order to grab the dish. To do so, I had to slide my waist out of my perfectly aligned center of gravity position inside the deflated rubber tire and wiggle out to where my thighs were holding me in place. My outstretched fingers were just beginning to close around the metal food dish when the evil monkey leapt off the cable and disappeared in a nose dive. I temporarily lost sight of him, but I could hear his Tarzan like yell as the pulley wheel whizzed and he thumped his little chest. Then, to my horror, the gorilla suddenly came swinging up holding onto his Tarzan-like chain and then let go in a perfectly timed move the Flying Wallenda’s would have applauded. The flying furry fanged beast was hurling straight at my face which caused me to not only let out a bloodcurdling scream, but also let go of my grip on the treehouse. I remember thinking how much faster I was going down than going up. That’s also when I remembered I had wiggled out of my perfectly aligned center of balance position in the inner-tube. As the rope swing pulled me away from the crazed gorilla, it also released me to fight gravity all by myself. Fortunately, I landed on a rather large and rotten mango which sufficiently softened my fall so I only broke the two bones in my left forearm. Later, as the emergency room doctor was putting a cast on my broken arm and pulling mango out of my hair, he asked if I could once again tell the story of how my monkey broke my arm. But this time, he asked if he could invite a few of his fellow staff members to listen. 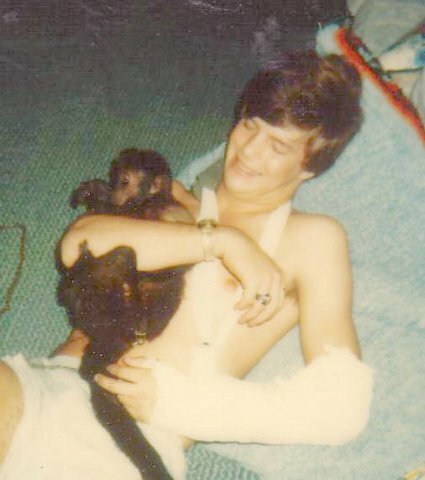 Apparently, I was his first patient to have his arm broken by a little two-and-a-half pound monkey. My arm healed and I stopped throwing mangos at Reepicheep and over time, we made up. He bit me a few times after that, but never again broke any of my other bones. Thankfully our rope swing remained, but we were no longer allowed to use it to “speed feed” the monkey. Even so, Reepicheep and I never fully trusted each other again. He, for one, lost his appetite for mangoes, and I lost my desire to be an Acapulco cliff diver. Perhaps it was all for the better.